Turkish President extends warm wishes to the Jewish community celebrating Rosh Hashanah in Turkey and around the world. Turkish President Recep Tayyip Erdogan on Sunday extended his warm wishes to the Jewish community celebrating Rosh Hashanah in Turkey and around the world. "We are members of a deep civilization, who give great importance to freedom of religion and belief, and consider social, cultural, religious and human diversity as wealth," said Erdogan, according to the Anadolu news agency. He added that Turkey protects the rights of its citizens to live their culture, religion and traditions freely without facing any discrimination. 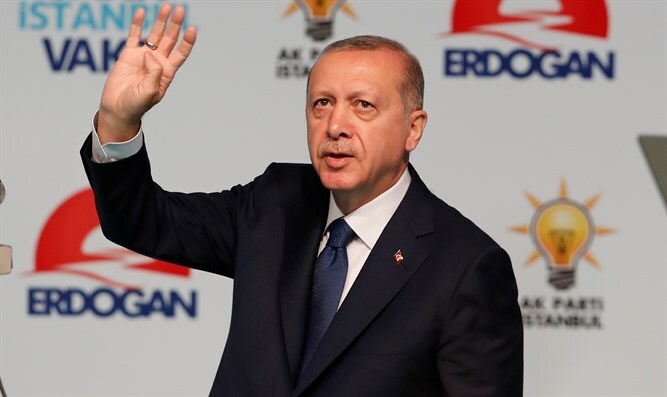 "I wish all Jewish people, especially our citizens a happy Rosh Hashanah festival, which is one of the important religious festivals of Judaism," said Erdogan. While the Turkish President is known for his criticism of Israel, he usually extends holiday greetings to Turkey’s Jewish citizens, most notably before Hanukkah. American officials several years ago expressed deep concern over the rising levels of anti-Semitism in Turkey, after a report revealed that young Turkish Jews were leaving the country in droves as a result of the anti-Semitism. Turkey has seen a rise in anti-Semitic hate crimes since the rise of Erdogan's Islamist AKP party. Although violent attacks are still relatively rare, anti-Jewish incitement has become commonplace.